Who would you like to see on a $1 bill? A young girl's letter to President Obama sparked a discussion about the possibility of adding women's faces on American currency. Obama mentioned the letter at an appearance Wednesday in Kansas City, Mo. "And then she gave me like a long list of possible women to put on our dollar bills and quarters and stuff, which I thought was a pretty good idea," Obama said. Soon, there was Oprah on a $20 bill thanks to New York Magazine, Harriet Tubman on a $100 bill from The New Republic and questions across the Twitterverse on why Beyoncé doesn't have her own bill (she is, after all, called Queen Bey). Though there isn't currently a woman on a paper note, there was once, in 1886. Martha Washington appeared on the $1 silver certificate, which could be redeemed for silver coins. Women have graced two dollar coins made mostly of copper. Susan B. Anthony is on one that looks something like a quarter, and Sacagawea is on what's known as the "golden dollar." Those coins remain in circulation, but are not currently in production. 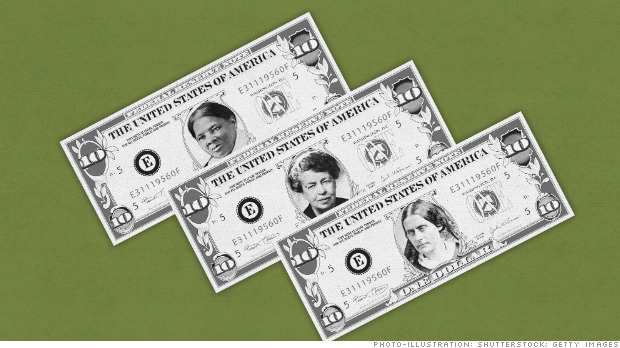 Which lady of history would you like to see grace your greenbacks? Vote!